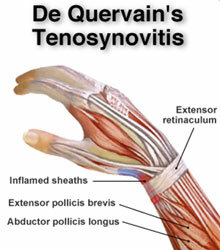 DeQuervain’s Tenosynovitis is an inflammation of the tendons and muscles of the thumb that extend to the wrist. More specifically they are the abductor pollicis longus and extensor pollicis tendon sheaths. DeQuervain’s Tenosynovitis is a condition caused by movements that require repetitive thumb use, such as using a Blackberry. The swollen tendons and their coverings rub against the narrow tunnel through which they pass causing inflammation and swelling. Soon after you begin to develop pain at the base of your thumb and into your forearm.